We took care of my friend’s two dogs when their boarding kennel was destroyed in Puerto Rico following Hurricane Maria. One of the dogs, Leo, comes from a very abusive background and crouches in fear if he thinks you are going to touch him. That makes putting on or taking off a harness extremely challenging. My friend suggested I just leave his harness on to avoid getting bitten and so that he could join us on walks. However, he was staying with us for a month and I didn’t want the little guy having to wear a harness all the time. One of my dog walking clients uses a Top Paw Easy Fit harness on her dog, and I thought it would be a perfect solution for Leo. The dog’s front paws go through the loop and then the harness fits over the shoulders and snaps above the back. There’s very little touching involved. It turned out to be a great choice for Leo. 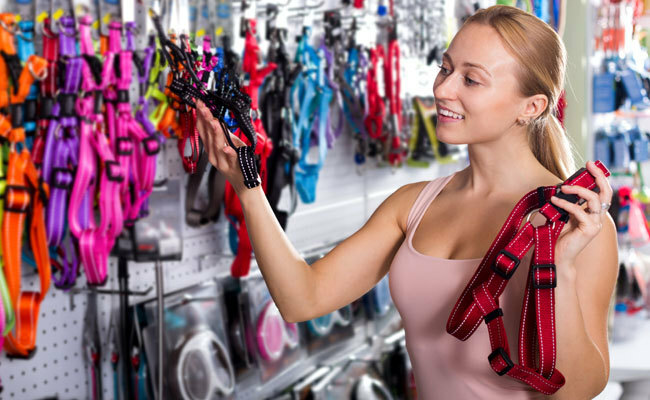 If you’ve shopped for a harness lately you know that there’s a huge selection. It can be challenging to choose the best one for your dog. 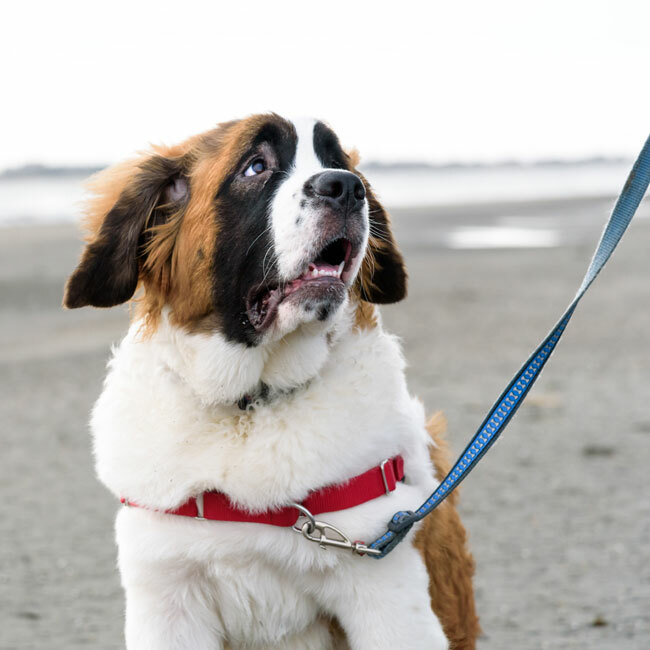 First and foremost you are making the right decision in choosing a harness over a collar said Megan Stanley, chair of the Board of Directors for the Association of Professional Dog Trainers. The best option is a harness that provides the ability to attach a leash at the front as well as on top. Dog owners can use the front attachment for when the dog is pulling and transition to the top when the pulling stops. Harnesses should also have a number of size adjustment points as these offer a more comfortable fit, help avoid chaffing and ensure that all of the pressure isn’t on the dog’s shoulders. For short-coated dogs or those with sensitive skin choose a harness with extra padding or one that is covered in soft material such as fleece. Check to make that the harness has strong stitching and that the connectors are either made of metal or durable plastic. When choosing a harness for a dog who is an escape artist consider one that offers a double attachment option. For example, many harnesses with frontal attachments allow for clipping the leash to the harness and the dog’s collar. The dog is still attached to the leash even if he/she gets out of the harness or a clip breaks or comes undone. Harnesses come in a wide range of prices and you should expect to pay at least $30 for a good harness. As a general rule the more expensive the harness the better the quality and the longer it is likely to last. When purchasing a harness Stanley recommends taking your dog to the store and enlisting the help of an assistant in choosing the right fit. Once at home it’s important she said to introduce the harness slowly to your dog especially if he/she hasn’t worn one before. Let the dog sniff and smell the harness before putting it on. Gradually work up to putting on and taking off the harness. The next step is to let the dog get comfortable wearing the harness around the house before heading out for a walk. Reward the dog with a treat as you advance through each step. The Whole Dog Journal provides a helpful review of dog harnesses to help when choosing the right one for your dog. I've never had trouble putting a harness on a dog. So many people don't realize that small dogs which pull as they walk need to steer clear of tight collars/harnesses.